Reusable bags are a great way to spread the word about your brand. A well-made bag will last for years and remind your customers of your brand while also introducing your company to others along the way. There are so many ways your brand can benefit from a custom reusable bag. We’ve come up with 5 ways your business can use a custom reusable bag – keep reading to learn more. Give Branded Bags Away at Trade Shows. Create a reusable bag designed to your specifications and emblazoned with your branding to give to folks who visit your trade show booth. As people carry your branded bag they will create a buzz around your brand at the show, and when they carry your custom bag after the show they will continue to spread the word about your company. Partner with a Charity. There are a lot of organizations doing good work to help those who are less fortunate either through collecting clothing, food, hygiene items, school supplies or other items. Oftentimes, these groups will fill reusable bags or backpacks with the items they collected and distribute them to those in need. Donate custom branded bags to such a cause and get your staff involved packing and distributing the bags. You’ll help people in your community who receive the care packages, you’ll help the planet by distributing reusable bags and you may even inspire others to follow your brand’s lead. Give Reusable Bags to Package Corporate Gifts. When you give a company gift during the holiday season use a custom branded bag to wrap the gift. This is easier than using traditional wrapping paper and cuts down on gift bags that typically are used once. Your vendors, merchants or customers will be able to re-purpose your branded bag and reinforce and spread your marketing message in the process. Include a Branded Bag with Customer Orders. Have bags printed with info explaining a new product or service to create interest leading up to the launch, and slip a bag in with customer orders as a surprise gift. Your customers will be thrilled to get a free gift and excited to have early access to this info. Giving your customers a customized bag will further develop your brand’s relationship with your loyal customers. Sponsor a Design Contest. Select an event worthy of a custom reusable bag. It can be a new product launch, an anniversary, reaching an eco milestone or any other significant occurrence for your company or in your community. Reach out to customers, employees, students or any other group and let them know that you are looking for design submissions for a custom bag. The winning design will be turned into custom reusable bags. Post to your blog and social media accounts to get the word out and create interest. Put the bags up for sale on your website or in your brick and mortar store, or give them away. Whatever you decide to do just make sure to get photos and post to your blog and social media accounts. 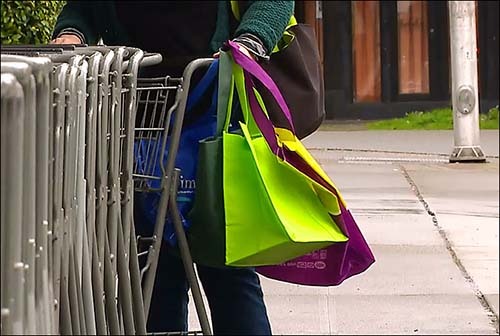 These are just five ways your business can use a custom reusable bag. There are countless other ways you can put a reusable bag to work for your brand. Do you have any ideas of ways to market your business with a customized reusable bag? Let us know in the comments.